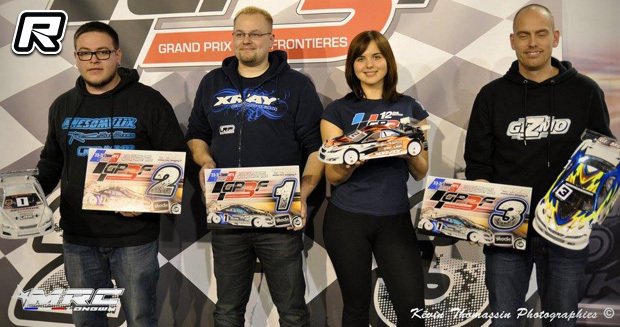 The annual Grand Prix des 3 Frontieres was held this past weekend in Longwy, France, with the usual mix of national talent and international pro drivers in attendance. In the Touring Modified class, with a total of 33 entries, Germany’s Ronald Völker soon made his intentions clear to bring home the win as he dominated the field from the first practice session on. The Yokomo driver would then sweep the qualifiers to grab the overall TQ from Viljami Kutvonen (Awesomatix) and Lucas Urbain (VBC Racing) who ended the qualifiers in second and third respectively. The A-mains then again saw Ronald reign again as he won all three legs with a 1-lap margin on the second place driver. Unfortunately for Viljami, problems in A1 and A3 meant he was not able to build on his qualifying performance, making way for Marc Fischer (Serpent) who grabbed the runner-up spot from Loic Jasmin (VBC Racing). In the highly competitive Touring Stock 10.5T class with 108 entries Awesomatix’ Max Mächler won four of the five qualifiers to take the TQ in front of Jan Ratheisky (Xray) and Martin Christensen, driving the Danish Gizmo touring car. The triple A-mains saw some nice fights for the overall victory with Jan and Max sharing the winning honours in A1 and A2 to shift the overall title decision into the third and final A-main. The leg then was ultimately won by Jan with Henrik Heitsch in second place. Max had to settle for 8th in A3 meaning the overall win for Jan Ratheisky with Max Mächler in second and Martin Christensen in third.